Aston Villa moved up to fifth in the Championship table with a comfortable 2-0 win over Preston. First-half goals from James Chester and Robert Snodgrass earned Steve Bruce his first managerial victory at Deepdale and means Villa have won six of their last eight league games. Preston remain 10th having lost their last three league matches, conceding eight goals in the process. Villa had a chance to take the lead inside the opening minute but Snodgrass sliced his effort from 12 yards onto the roof of the net after getting round his marker. 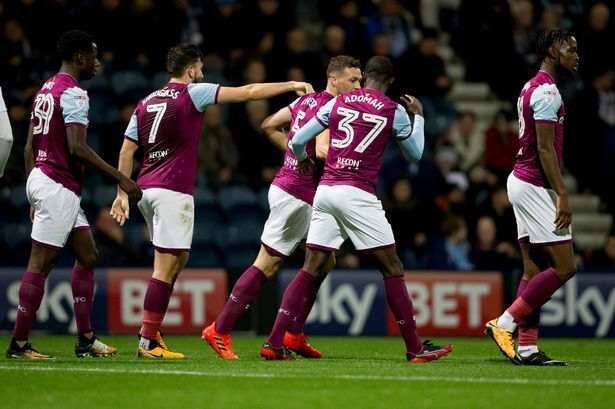 And the visitors could have scored again seven minutes later, as Albert Adomah burst down the right before cutting back to Keinan Davis but his strike from 12 yards was well saved by Chris Maxwell. But it only took another four minutes for that goal to come as Chester rose highest to nod Snodgrass' corner in from six yards. Preston, who lost at home for the first time this season against Brentford on Saturday, started to get a foothold in the game and came close through Jordan Hugill after 20 minutes as he nodded Josh Earl's cross just wide. But Villa remained the biggest threat, exposing a Preston side missing five first-team defenders. Josh Onomah won the ball from Daniel Johnson after 28 minutes before firing inches over from 20 yards. And they doubled their advantage after 33 minutes, capitalising on an under-hit pass from Ben Pearson which allowed on-loan Spurs midfielder Onomah to burst forward and square for Snodgrass to slide home from 12 yards. Preston were forced into two more defensive changes at half-time, having to move midfielder Alan Browne into a makeshift centre-back position. John Terry came close to widening the margin within a minute of the restart, stooping low to head Snodgrass' free-kick just over from 15 yards. It took until 66 minutes for Preston to call Sam Johnstone into meaningful action as he had to hold a long-range, dipping strike from substitute Paul Gallagher. Alex Neil's side, who are now winless in their last five Championship games, started to look more threatening as Tom Barkhuizen and Daniel Johnson both had efforts blocked inside the Villa penalty area. But the visitors should have made it three on 77 minutes as Conor Hourihane slipped Adomah through inside the area but he placed a strike into the side-netting with only Maxwell to beat.